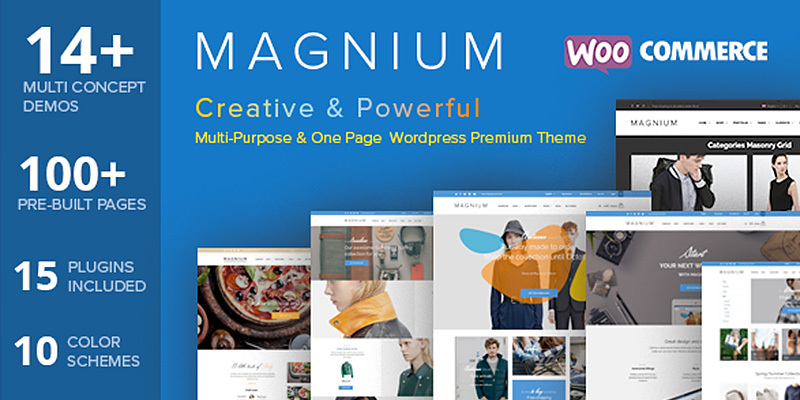 Magnium theme is one of the fastest and powerfull multipurpose WordPress themes that can be used as Regular or Onepage website. This theme can be used for any personal or business needs to easy create and launch your WordPress based website in several minutes. Intuitive Page Builder with 20+ custom Magnium elements and Frontend Live Visual Editor, 11 pre-build Homepage Layouts (create unlimited variations yourself), 100+ prebuild ready to use pages, 10 Built-in skins (create unlimited skins yourself), Unlimited theme layout variations, Unlimited header layouts, 500+ available theme customization options will help you transform Magnium theme into a easy to use business selling tool. Magnium theme is 100% responsive (Bootstrap 3), SEO optimized and uses only CSS for fast loading. Theme compatible with WordPress 3.5 – 4.x, WooCommerce 2.1.x-2.3.x and WPML.